While Stephen Chow’s Journey to the West: Conquering the Demons, is probably on the way to creating another box office record in the history of Chinese cinema, his hopes for Journey to the West aren’t confined to the silver screen. ChinaVision Media Group Ltd, one of the blockbuster’s investors, announced on Tuesday that its wholly owned subsidiary West Gold has entered into an agreement with the city government of Tongxiang in Zhejiang province to cooperate on the establishment of a Journey to the West Film Art Center project. The government of Tongxiang will make available approximately 70 hectares in Wuzhen for the project. The planned area consists of a parcel of land with an area of 46 hectares, which is for sale, and another parcel of 24 hectares, which is for lease, according to the agreement. If West Gold completes the acquisition of the land use rights and leasehold interest, it will develop the area by establishing a joint venture, in which it will hold 75 percent of equity interest, while Stephen Chow holds the remaining 25 percent, according to the Film Art Center Framework Agreement, which was signed in October 2012. It is expected that the cooperative agreement will be signed within the next few days. As planned, the movie-themed project will feature cultural tourism, entertainment and technology. The project is scheduled to be launched at the end of this year, and is due to be completed in 2015. However, actor-director Chow is not the first to have plans to develop movie-themed parks on the Chinese mainland. Huayi Brothers Media Group Co Ltd, one of the leading private film production companies in China, expanded into the field in 2011. The listed film company signed an agreement in February with the Shanghai Jiading Industrial Zone to build a cultural complex in the area. The project will be primarily used as a film production base, such as Zhejiang Hengdian World Studios. The latest move by the entertainment conglomerate came in May 2012, when it announced its co-investment in a movie-themed commercial zone in Haikou, Hainan province. In this commercial zone, there will be streets and blocks that imitate the cinematic scenes of Huayi Brothers’ film productions. The zone, covering nearly 1 square kilometer and featuring scenes from classic movies made by the company’s top director Feng Xiaogang, as well as restaurants, stores, cinemas and hotels, was named after the director and also marks the company’s first move into commercial real estate. Haikou is not a stand-alone project. Huayi Brothers is planning to spend four to five years building another movie-themed park in Suzhou, Jiangsu province, even though the coming Disney resort will be just a two-hour drive away. 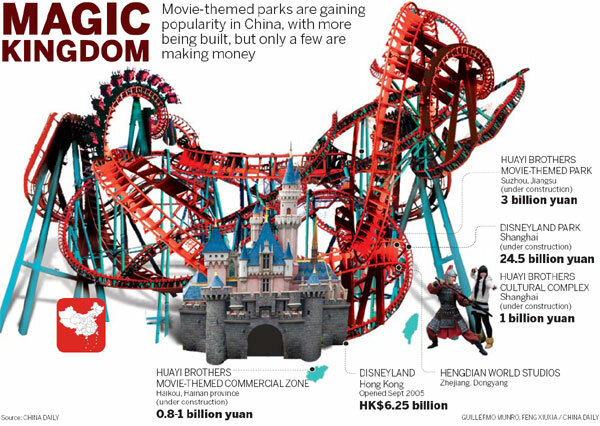 However, although the number of theme parks may have grown in China in recent years, few of them are making money. Zhao Huanyan, a senior researcher at the Tourism Research Institute under the Shanghai Academy of Social Sciences, said that a total of 150 billion yuan has been invested in more than 2,500 theme parks in China, and 70 percent of them are in deficit, 20 percent are breaking even, and only the remaining 10 percent are making profits. Creativity and market positioning are the most important elements in successfully running a theme park, and for movie-themed parks, professional support facilities, diverse scenes and competitive pricing are also crucial, added Yang Yanfeng, an associate professor of the China Tourism Academy. "Blind investment is the biggest reason for the widespread losses. The first investment boom in theme parks took place in the 1990s, while the third boom is currently under way," Yang said.